To determine and compare the diagnostic accuracy of fluoride-PET/CT (NaF-PET/CT), choline-PET/CT, whole-body bone SPECT/CT (WB-SPECT/CT) and whole-body MRI (WB-MRI) for the detection of bone metastases in patients with prostate cancer. From April 2014 to April 2016, 230 patients with prostate cancer referred for bone imaging were included in the study and underwent three index tests: A routine NaF-PET/CT, a WB-MRI, and half of the patients a WB-SPECT/CT and the other half of the patients a choline-PET/CT. Experienced specialist assessed whether 0, 1–5 or > 5 bone metastases were present. In the absence of a histological reference standard, the final diagnosis was determined by an expert panel based on a review of the index tests, patient files and clinical follow-up images for a minimum of 1.5 years. Two hundred thirteen patients constituted the final study population. Sixty-two patients (29%) were classified with metastatic bone disease as their final diagnosis. The proportion of patients misclassified was (false positive vs false negative): NaF-PET/CT 5% vs 1%, choline-PET/CT 1% vs 1%, WB-SPECT/CT 6% vs 0% and WB-MRI 7% vs 3%. Patient-based diagnostic performances were (sensitivity, specificity, overall accuracy): NaF-PET/CT (95%, 93%, 93%), choline-PET/CT (97%, 99%, 98%), WB-SPECT/CT (100%, 91%, 94%) and WB-MRI (89%, 90%, 90%). No significant differences in the diagnostic performances were detected. A trend towards overestimating the number of bone metastases was observed for NaF-PET/CT only (p = 0.04). All three nuclear medicine methods and WB-MRI had favourable diagnostic performances for the detection of bone metastases with no significant difference between them. Prostate cancer is the most common cancer diagnosed in men in Europe and one of the cancers that most frequently metastasise to the skeleton (Bertoldo et al. 2017). The presence of metastatic skeletal disease is highly prognostic and has major impact on patient management (Padhani et al. 2017a; Crawford et al. 2014). Conventional planar bone scintigraphy performed with the bone-targeting tracer 99mTc-diphosphonate has been considered the international reference standard for bone imaging of patients with prostate cancer for more than 40 years. However, newer gamma cameras with the ability to perform (3D) SPECT image acquisition to be combined with a CT scan have proven to be more sensitive and specific, and whole-body bone SPECT/CT (WB-SPECT/CT) has been appointed as a possible future replacement for conventional planar bone scintigraphy (Even-Sapir et al. 2006; Palmedo et al. 2014). In recent years, PET/CT has become a cornerstone in oncological imaging. The most widely used tracer, 18F-fluorodeoxyglucose (FDG), is however of limited value in prostate cancer patients (Kundra et al. 2007). The bone targeting tracer, 18F-fluoride (18F-NaF), is an indicator of bone turnover (osteoblast activity) and blood flow comparable to 99mTc-diphosphonate. However, 18F-NaF has more favourable pharmacokinetic characteristics and the PET camera offers a higher spatial resolution than the gamma camera (Hicks and Hofman 2012). The bone-targeting tracers indirectly visualise the tumor cells as they accumulate corresponding to a secondary bone reaction that is activated by the presence of metastatic tumor cells in the bone marrow (Bertoldo et al. 2017). In comparison, cancer-targeting tracers accumulate in the cancer cells, i.e. 11C-choline (or 18F-choline) accumulates in prostate cancer cells due to a malignancy-induced increased demand for cellular membrane synthesis (Jadvar 2012). With the increase of availability (and affordability) of PET/CT scanners and cyclotrons, imaging performed with 18F-NaF and 11C-choline is emerging as a feasible and accurate imaging method for the detection of bone metastases in patients with prostate cancer (Wondergem et al. 2013). Advances in MRI have enabled the acquisition of whole-body (WB) MRI images and diffusion-weighted images (DWI). Conventional MRI depicts the early replacement of the normal bone marrow by tumor cells before the osteoblastic response takes effect, and is also sensitive to the latter (Bertoldo et al. 2017). DWI allow a functional assessment depicting restricted water diffusion caused by the densely packed tumor cells and enhance the early detection of cancer cells in the bone marrow (Padhani et al. 2017a; Cook et al. 2016; Padhani and Koh 2011). With its absence of ionising radiation, recent technological developments and ability to visualise the bone marrow, WB-MRI is emerging as an attractive technique for the detection of bone metastases in several cancer patients including patients with prostate cancer (Vassiliki et al. 2018). The purpose of this study was to determine and compare the diagnostic accuracy of NaF-PET/CT, choline-PET/CT, WB-SPECT/CT and WB-MRI (including DWI) for the detection of bone metastases in patients with prostate cancer. This is a prospective single-centre study. The regional ethics committee approved the study protocol (approval number H-1-2014-018). Written informed consent to participate was obtained from all two hundred thirty participants included in the study in the period from April 2014 to April 2016. The inclusion criterion was patients with biopsy proven prostate cancer referred to the standard bone imaging method at our institution: NaF-PET/CT. The patients referred to NaF-PET/CT represented a broad disease spectrum from newly diagnosed to patients known with bone metastases. Exclusion criteria were: Prior or current chemotherapy or abiraterone treatment, prior radiotherapy of bone metastases, prior malignancy (except for adequately treated basal cell or squamous cell skin cancer), bone metabolism disorder, osteomyelitis, and any conditions contraindicated for MRI scan or a CT contrast agent. On the day of the routine NaF-PET/CT, the patients were consecutively invited to participate in the study. Each patient was only allowed to enter the study once during the inclusion period. Patients willing to participate underwent three scans within 30 days: A routine NaF-PET/CT, a WB-MRI and either a WB-SPECT/CT (group A) or a choline-PET/CT (group B). The allocation to either a WB-SPECT/CT or a choline-PET/CT was random and based on logistics such as scanner and tracer availability at the time of inclusion. Seventeen patients were excluded from the subsequent analyses due to: Change in therapy between the three scans, an incomplete/a lacking scan, or > 30 days elapsed between the first and the last scan. Figure 1 shows a flow diagram of patient inclusion. Reporting was done in accordance with the Standards for Reporting of Diagnostic Accuracy Studies (STARD) statement (Bossuyt et al. 2015). The imaging techniques the accuracies of which were evaluated, are referred to as “index tests” in accordance with the STARD definition. The NaF-PET/CT scans were performed with either Gemini TF (Philips Healthcare, Best, the Netherlands) (n = 51) or Biograph mCT (Siemens Healthcare, Munich, Germany) (n = 162), based on availability. Images were obtained from the top of the skull to just below the knees. The total scan time was approximately 10 min. The choline-PET/CT scans were performed with Biograph mCT (Siemens Healthcare, Munich, Germany) and the patients were advised to fast 5 h prior to imaging. Images were obtained from the top of the skull to just below the knees. The total scan time was approximately 20 min. The WB-SPECT/CT was performed with Precedence (Philips Healthcare, Best, the Netherlands). Images were obtained from the top of the skull to mid-thigh. The total scan time was approximately 75 min. WB-MRI was performed with whole-body 3.0 T Ingenia (Philips Healthcare, Best, the Netherlands). Images were obtained from the top of the skull to the feet. The examination protocol consisted of coronal T1, sagittal T1 of the vertebral spine, coronal STIR-weighted (short T1 inversion recovery) and axial DWI (b0, b1000). The total scan time was approximately 70 min. Further technical scanner details are presented in Additional file 1: Tables S1 and S2. The image analysis was performed visually at a work station. Specialists in the field of nuclear medicine or radiology with 8–21 years of experience interpreted the scans. Two nuclear medicine specialists read NaF-PET/CT (HWH, CM), choline-PET/CT (HWH, CM), and WB-SPECT/CT (CM, BZ), and two radiologists read WB-MRI (VBL, EMP). The readings were performed after the inclusion of the last participant and within a short period. Images were anonymised. Readers who read more than one modality on the same patient had a period of minimum one month between the readings. The image evaluations were performed blinded to other imaging results and clinical data except the fact that the patients were known to suffer from prostate cancer and were referred for a routine NaF-PET/CT. Each reader assessed whether 0, 1–5 or > 5 bone metastases were present. An equivocal conclusion was not an option. In patients with 1–5 bone metastases the exact number and anatomical localisation were noted. Discrepancies between the two readers were solved at a consensus meeting, and if consensus could not be reached, a third experienced specialist would make the final decision. On NaF-PET/CT, choline-PET/CT and WB-SPECT/CT the patient was diagnosed with bone metastases if the intensity and the pattern of the tracer accumulation were considered highly suspicious of metastatic bone disease with or without corresponding findings on CT scan (focal uptake significantly above background level and not considered benign). Bone metastases were suspected on the MRI scan corresponding to lesions with hypointense signal intensity on T1, intermediate or high signal intensity on STIR, and high signal intensity on DWI b1000 combined with low signal intensity on apparent diffusion coefficient (ADC) images. No quantitative cut-off value was applied for ADC. As recommended in the literature, MRI lesions smaller than 5 mm were not characterised (Moulopoulos and Koutoulidis 2015). In the absence of a histological reference standard, the final diagnosis (0, 1–5, > 5 bone metastases) was determined as a panel diagnosis by three imaging specialists with several years of experience from weekly multidisciplinary conferences on patients with prostate cancer. The panel meeting took place one and a half year after the inclusion of the last study participant. In patients with a concordant diagnosis of the three index tests regarding the number of bone metastases (i.e. all three methods detected either 0, 1–5 or > 5 bone metastases), this diagnosis was considered the final diagnosis. In patients with a discordant diagnosis of the three index tests, the panel determined the final diagnosis based on a side-by-side evaluation of the index tests, a review of clinical data from patient files (clinical, medical, laboratory and pathological files) and available clinical follow-up images (including NaF-PET/CT, choline-PET/CT, MRI and CT scans). The follow-up period ranged from 1.5–3.5 years. To validate the plenary decision process, a sample of five patients were reassessed by the panel committee blinded to their first judgement. In all patients, the first and second judgements were identical. A summary of how the final diagnoses were established is presented in Additional file 1: Table S3. The data analyses were performed using R software (version 3.2.3; www.r-project.org) unless stated otherwise. 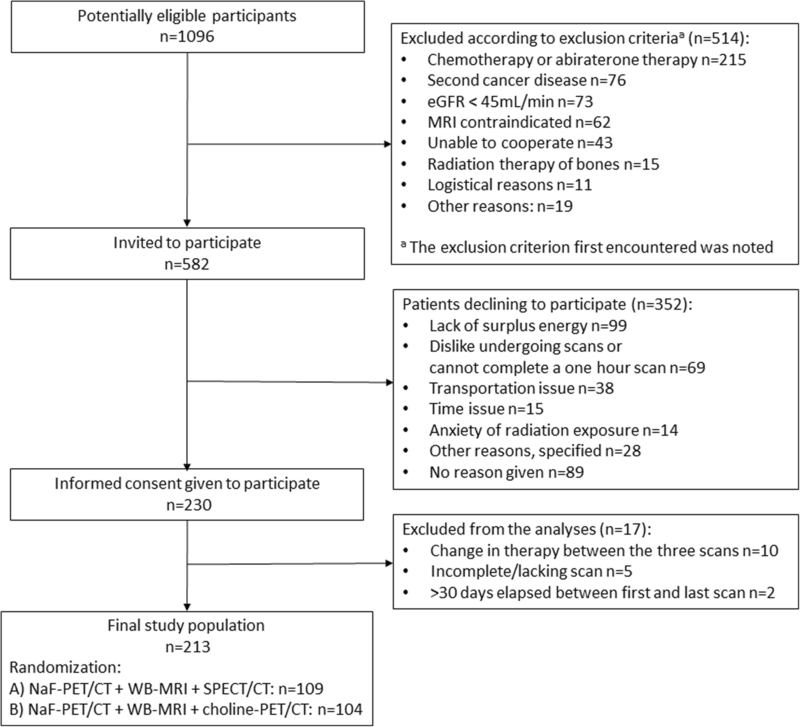 Student’s t-test, Mann-Whitney U test, and chi2/Fisher’s exact test were performed to compare baseline characteristics for 1) patients randomised to either WB-SPECT/CT or choline-PET/CT, 2) patients unwilling to participate versus patients willing to participate and 3) patients classified with versus without bone metastatic disease. If an expected cell frequency was less than five, Fisher’s exact test was carried out instead of chi2 test. Measures of diagnostic performances were calculated on a patient-based level. McNemar test (paired data) and chi2/Fischer’s exact test (unpaired data) were performed for comparisons of sensitivities, specificities and overall accuracies. Additional comparisons were performed with a generalised mixed effect model taking into account that each participant underwent scans with three different methods (SAS software, version 9.4, SAS institute Inc., Cary, NC, US). The agreement between each index test and the final diagnosis with regard to the number of bone metastases (0, 1–5, > 5) was assessed with calculated Kappa coefficients. To investigate whether the index tests had a tendency to over- or underestimate the number of bone metastases, a Wilcoxon signed rank test was performed. Interreader variability was determined calculating Kappa coefficients. A p value < 0.05 was considered statistically significant. Shown p values are uncorrected and when appropriate Bonferroni correction was performed as mentioned in the footnote of the tables. Patients who declined to participate in the study were significantly older than the patients who were willing to participate (mean age 76 vs 72 years, (p < 0.0001). However, there was no difference in the results of the routine NaF-PET/CT reports regarding the presence of bone metastases (p = 0.67). Two hundred thirteen patients (aged 49–90 years) constituted the final study population and were referred for a routine NaF-PET/CT due to the following reasons: Initial staging based on risk profile (n = 40), suspicion of progression in patients a) treated with curative intent (n = 15), b) in active surveillance (n = 12) and c) in watchful waiting (n = 14), and monitoring of patients in androgen deprivation therapy (ADT) (n = 132) (Table 1). One hundred nine patients underwent the scanning combination NaF-PET/CT, WB-MRI and WB-SPECT/CT (group A), and 104 patients underwent the scanning combination NaF-PET/CT, WB-MRI and choline-PET/CT (group B). No difference in baseline characteristics was observed between group A and B (Table 1). On average 10 days elapsed between the day the participants underwent the routine NaF-PET/CT and respectively a WB-MRI (range 1–29 days), a WB-SPECT/CT (range 1–28), and a choline-PET/CT (range 2–27 days). Discrepancies between the two readers were solved at a consensus meeting in the following proportion of patients: 12% (26/213) for NaF-PET/CT, 4% (4/104) for choline-PET/CT, 15% (16/109) for WB-SPECT/CT and 15% (33/213) for WB-MRI. Consensus could not be reached on NaF-PET/CT in 4 patients, on WB-SPECT/CT in 3 patients and in one patient on choline-PET/CT and WB-MRI respectively, and necessitated third reader assistance. Determination of interreader variability resulted in Kappa coefficients corresponding to almost perfect agreement (choline-PET/CT, NaF-PET/CT) and substantial agreement (WB-SPECT/CT, WB-MRI) (Additional file 1: Table S4). Sixty-two out of 213 patients (29%) were diagnosed with metastatic bone disease as their final diagnosis: 34 patients with oligometastatic disease (1–5 bone metastases) and 28 with multiple bone metastases (> 5 bone metastases). The proportion of patients classified with bone metastatic disease per referral group was: Initial staging based on risk profile (n = 4), suspicion of recurrence after curative intended treatment (n = 2), suspicion of progression in patients in watchful waiting (n = 2) and monitoring of ADT (n = 54). The prostate specific antigen (PSA) level at primary diagnosis, the PSA level at time of study inclusion, and the Gleason grade groups were significantly higher for patients classified with bone metastatic disease versus patients classified without bone metastatic disease (Table 2). The proportion of patients misclassified with bone metastatic disease (false positive patients) was 5% (11/213) for NaF-PET/CT, 6% (7/109) for WB-SPECT/CT, 7% (15/213) for WB-MRI, and only 1% (1/104) for choline-PET/CT (Table 3). The proportion of patients misclassified as free of bone metastatic disease (false negative patients) was 3% (7/213) for WB-MRI and 0–1% (0–3 patients) for the three nuclear medicine methods (Table 3). The patient-based diagnostic performances were (sensitivity, specificity, overall accuracy): NaF-PET/CT (95%, 93%, 93%), choline-PET/CT (97%, 99%, 98%), WB-SPECT/CT (100%, 91%, 94%) and WB-MRI (89%, 90%, 90%) (Table 3). A significant difference in the specificity and overall accuracy between choline-PET/CT and WB-MRI was detected (p = 0.04, p = 0.02), but after correcting for multiple testing these differences were non-significant (Additional file 1: Table S5). All other pairwise comparisons were non-significant (Additional file 1: Table S5). A lesion highly suspicious of a bone metastasis detected on NaF-PET/CT, WB-SPECT/CT and WB-MRI is illustrated in Figs. 2 and 3. A subgroup analysis comparing the diagnostic performances of the index tests for patients naïve to ADT versus patients receiving ADT did not indicate any differences in diagnostic accuracy measurements of the index tests (Table 4). Patients naïve to ADT included newly diagnosed patients, patients treated with curative intent and patients in active surveillance or watchful waiting. However, three patients treated with curative intended radiation therapy were excluded as they had previously received adjuvant ADT. The agreement of the index tests with the final diagnosis per study participant is illustrated with colour codes in Fig. 4. The data behind are summarised in Additional file 1: Table S6. The agreement between each index test and the final diagnosis with regard to the number of bone metastases classified (0, 1–5, > 5) was “almost perfect” for choline-PET/CT (Kappa coefficient (K):0.90 (95%CI: 0.81–0.98)), NaF-PET/CT (K:0.81 (95%CI: 0.73–0.89)) and WB-SPECT/CT (K:0.81 (95%CI: 0.70–0.92)) and “substantial” for WB-MRI (K:0.73 (95%CI: 0.64–0.83)). A trend towards overestimating the number of bone metastases was observed for NaF-PET/CT (p = 0.04), whereas no tendency to over- or underestimate the number of bone metastases was observed for choline-PET/CT (p = 0.23), WB-SPECT/CT (p = 0.22) and WB-MRI (p = 0.34). The diagnosis of bone metastases has major impact on patient management. This study is presently the largest prospective study determining and comparing the diagnostic performances of NaF-PET/CT, choline-PET/CT, WB-SPECT/CT and WB-MRI for the detection of bone metastases in patients with prostate cancer. The compared imaging methods visualise different entities of bone metastases. NaF-PET/CT and the WB-SPECT/CT visualise the secondary bone reaction induced by the prostate cancer cells, and the camera characteristics and tracer kinetics are theoretically in favour of NaF-PET/CT. Choline-PET/CT and WB-MRI directly visualise the prostate cancer cells due to an increased membrane turnover and a replacement of the normal bone marrow and a restricted water diffusion respectively. Despite these different points of attack, no significant difference was found in the diagnostic performances of the four imaging techniques. The patient-based diagnostic performances were advantageous for all four imaging methods investigated with sensitivities ranging from 89 to 100% and specificities from 90 to 99%. Favourable pooled patient-based sensitivities and specificities were also published in recent meta-analyses and review studies (Table 5). Only one study on WB-SPECT/CT is included in Table 5, but a recently published prospective study of patients with prostate cancer (n = 37) reported a comparable patient-based sensitivity and specificity of WB-SPECT/CT (89% and 100%) (Fonager et al. 2017). The largest fraction of false negative scanning in this present study (7/213) was reported for WB-MRI. The high amount of image data presented to the reader of whole-body MRI probably increased the number of false negative findings, as three patients retrospectively had findings compatible with bone metastases at the re-evaluation during the panel meeting. The MRI protocol did not completely meet the recently introduced MET-RADS-P criteria proposed by an international expert group as data collection was initiated before their publication (Padhani et al. 2017b). NaF-PET/CT is known to be very sensitive and unspecific. In this study a trend towards an overestimation of the number of bone metastases was observed for NaF-PET/CT despite the fact that the readings were performed by specialists working in a high-volume centre with NaF-PET/CT as the routine bone imaging method. NaF-PET/CT falsely classified nine patients with a solitary bone metastasis (pelvis (n = 5), rib (n = 3), spine (n = 1)) and two patients with two bone metastases (ribs alone (n = 1), rib and pelvis (n = 1)). However, in clinical routine a singular bone lesion is reported with great care and compared to clinical data, previous imaging results and possibly supplemental or follow-up images to make the final diagnosis on a basis that is as solid as possible. Three patients were classified with a false negative NaF-PET/CT scan. This can be explained by a not yet incited osteoblastic response to the tumour cells and thereby the mode of action of the tracer 18-NaF. All four imaging methods investigated classified the number of bone metastases (0, 1–5 (oligometastatic), > 5 (multiple)) with “almost perfect” or “substantial” agreement compared to the final diagnosis. This is noteworthy in the perspective of the rising new treatment options for patients with oligometastatic disease and the increasing evidence of a more favourable prognosis for patients with oligometastatic disease compared to more widespread disease (Bertoldo et al. 2017; Gillessen et al. 2018). The favourable diagnostic performances of the four imaging methods investigated indicate that the choice of imaging method may depend on local parameters like availability and costs. However, also priorities in local health care systems and private health insurance reimbursement policies influence the choice of imaging method. In regard to availability, the gamma camera is worldwide distributed, and the advanced version WB SPECT/CT showed comparable diagnostic performances to both PET/CT and MRI. However, institutions with access to PET/CT and an on-site cyclotron can benefit from a higher throughput and lower cost associated with PET/CT. These considerations have led to the discontinuation of the gamma camera and implementation of NaF-PET/CT as the first-choice routine bone imaging method for patients with prostate cancer at our institution. Furthermore, NaF-PET/CT is supplemented with choline-PET/CT or MRI in patients with a mismatch between imaging results and clinical findings. An advantage of both choline-PET/CT and WB-MRI is the potential to perform a “one stop shop” examination of patients referred for imaging of metastases not only in bones but also non-osseous. This study has limitations. First, it is based on a selected group of patients representing a broad disease spectrum of prostate cancer. The included patients were homogenous in terms of their diagnostic requirements, but heterogeneous in terms of their indications for bone imaging reflecting clinical everyday life. This study did not have statistical power to investigate whether the diagnostic performances of the index tests differed in the five referral groups. However, a comparison of the diagnostic performances of the index tests for patients naïve to ADT versus patients receiving ADT did not indicate a difference in performance for any of the index tests. Second, as stated by Wondergem et al., the quest for a suitable reference standard is probably more difficult than that for a better diagnostic imaging modality for bone metastases in patients with prostate cancer (Wondergem et al. 2013). A histological reference standard independent of the imaging techniques is preferable, but biopsies of all suspicious bone lesions (and theoretically of non-involved bone too) are both practically and ethically impossible to perform. In this study, image criteria from daily clinical practice were applied, and the final diagnosis was determined as a panel diagnosis. A panel diagnosis has been described as a reasonable method to evaluate diagnostic tests when there is no gold standard, and seems currently to be the most attractive and frequently applied method in diagnostic accuracy studies investigating the detection of bone metastases in patients with prostate cancer (Fonager et al. 2017; Pyka et al. 2016; Janssen et al. 2018; Lecouvet et al. 2012; Jambor et al. 2016; Rutjes et al. 2007). In patients with a concordant diagnosis of the three index tests this result constituted the final diagnosis. Evidence seemed solid with three teams of readers reaching the same diagnosis, and a comparable approach has been preferred in previous studies (Beheshti et al. 2008; McCarthy et al. 2011; Garcia et al. 2015). However, a final diagnosis based on the index tests investigated can lead to an incorporation bias and a possible overestimation of the diagnostic performances, but might not privilege one or the other of the imaging techniques investigated (Pyka et al. 2016; Sunshine and Applegate 2004; Ulaner 2017). This study demonstrated that the diagnostic performances of NaF-PET/CT, Choline-PET/CT, WB-SPECT/CT and whole-body MRI were favourable for the detection of bone metastases in patients with prostate cancer. No significant difference in the diagnostic performances was found between the imaging methods indicating that the choice of imaging modality may depend on patient preferences, local availability and costs. However, further studies investigating more homogenous patient groups and the impact of the imaging methods on clinical outcome and their cost-effectiveness are still required to get the whole picture of their efficacy. The authors are very grateful to all the patients who participated in the study and to the staff at the involved departments for their contribution to and support of the study. Special thanks to statisticians Tobias W. Klausen and Stig S. Mortensen, who provided statistical support, senior radiographer Jakob M. Møller, who was responsible for the MRI protocol, and medical students Emil L. Larsen and Cecilie K. Johnsen, who helped with the recruitment of study participants. Scholarships (principal investigator) from the University of Copenhagen and from Poul Lundbeck and wife’s foundation for the promotion of radiology in Denmark. The publication of this article was supported by funds of the European Association of Nuclear Medicine (EANM). Further data are available upon request. Please contact the corresponding author. Study conception and design: HWH, HST, ED. Recruitment of study participants: ED. Image analysis: HWH, VBL, CM, EMP, BZ. All authors contributed to the content of this manuscript and read and approved the final manuscript.